Feed is certainly a premium these days which means it is important to reduce feed waste as much as possible. 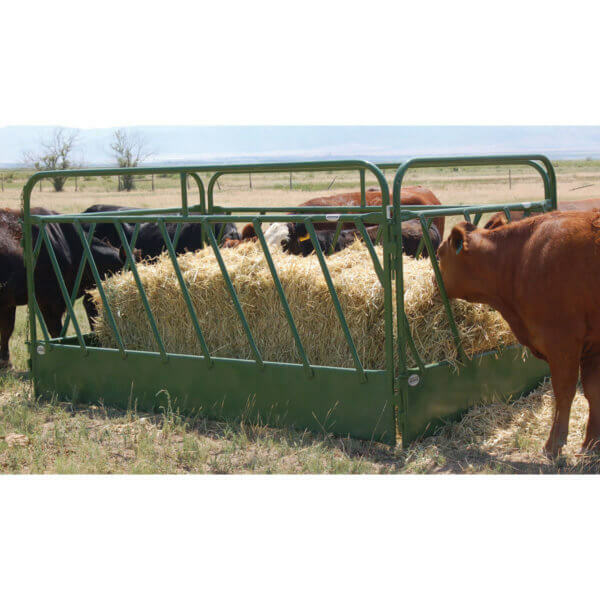 Powder River’s Classic Square Bale Feeder will allow you to conserver that feed by keeping cattle from trampling it into the ground. The Square Bale Feeder consists of 2-6′ Classic Feeder Panels and 2-10′ Classic Feeder Panels. A perfect size fro one ton bales. The slant bar design keeps the heads of the cattle from pulling out as easily this keeps any dropped feed inside the feeder. As the cattle eat away from the bale the will increase pressure on the panels. The Square Bale Classic Feeder will handle that pressure. Powder River’s Classic Square bale Feeder pins together in minutes with our popular pin and clip system.